I’ve been posting domain time articles for a long time, and on more than one occasion I’ve really needed to take my Windows time from a Cisco Device and failed miserably. I’ve even used third party NTP software to solve this problem on my own test network. On a client network, my colleague deployed ACS5 this week, I secured the ASA5585-X for AAA and it failed authentication. 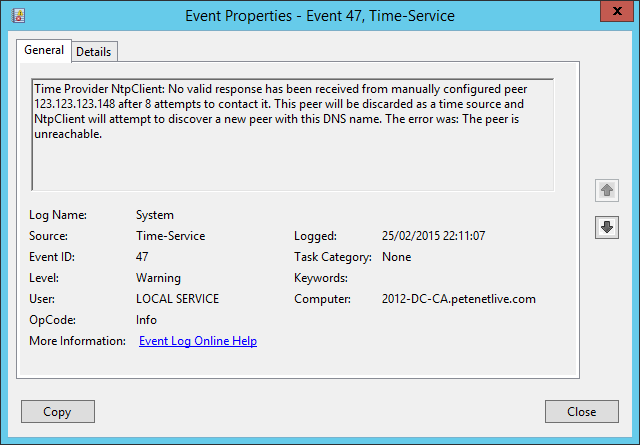 Logging revealed a clock skew error, so we manually set the time on the domain PDC. Within half an hour it was failing. The network topology prevented me syncing to a public NTP server from the domain PDC. We did however have all the network devices syncing from a public time source, if only we could use one of those? 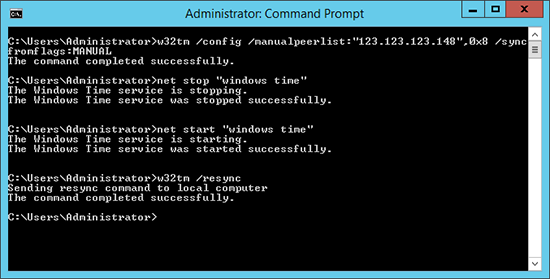 Step 1 Configure NTP on your Cisco Device. Here I’m using a 7200 Router in GNS3, the NTP IP addresses I use are UK based NTP servers, I suggest you replace them with some public NTP servers on your own continent. I’m using two for redundancy. It can take a while for NTP, (go and have a coffee), then check it’s synchronised, DO NOT proceed until the Cisco device has synchronised. system poll interval is 16, last update was 3 sec ago. In the past I’ve said “Windows Does not use NTP, it uses Win32 Time” This is not strictly true, it does use NTP, but by default it uses ‘Symmetric Active Mode NTP’ and your Cisco Device expects its NTP requests to be submitted via ‘Client Mode NTP‘. (See MS KB 875424 for more info). 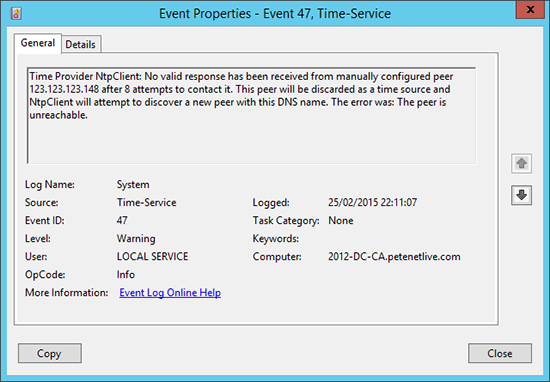 Note: By default Windows Domains take their time from the PDC emulator, carry this procedure out on that server! Now in the Servers System log, you should see the following two events logged. error was: The peer is unreachable. 000031: Feb 25 22:07:45.831: NTP message received from 123.123.123.151 on interface 'GigabitEthernet0/0' (123.123.123.148). 000033: Feb 25 22:07:45.835: NTP Core(DEBUG): ntp_receive: peer is 0x67A57898, next action is 1. 000034: Feb 25 22:07:54.967: NTP message received from 123.123.123.151 on interface 'GigabitEthernet0/0' (123.123.123.148). 000036: Feb 25 22:07:54.971: NTP Core(DEBUG): ntp_receive: peer is 0x67A57898, next action is 1. 1. UDP Port 123 is blocked between Windows and the Cisco NTP device. 2. The Cisco NTP device has not synchronised form a reliable NTP source. 3. The stratum of the Cisco NTP device is to high. 4. 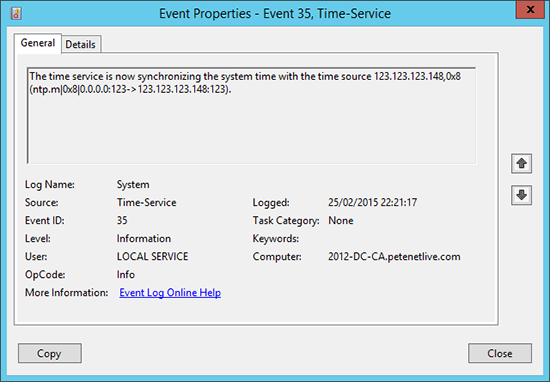 Windows is attempting to sync time using ‘Symmetric Active Mode NTP‘ See my comments above.